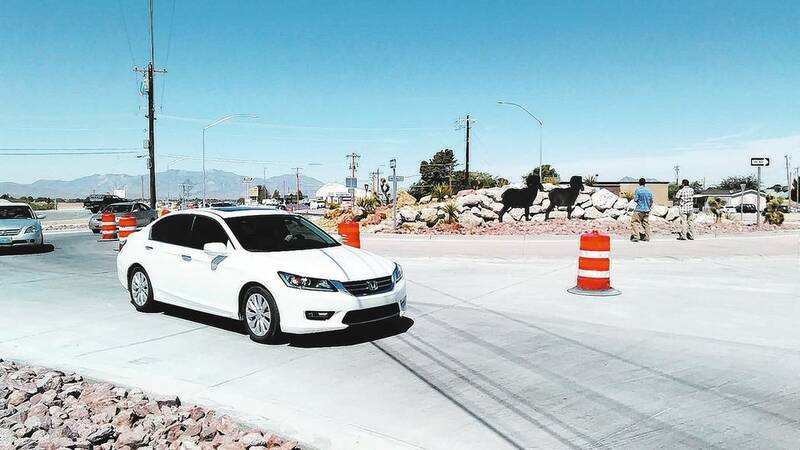 Selwyn Harris/Pahrump Valley Times Motorists began driving through the newly constructed roundabout at Highway 372 and Pahrump Valley Boulevard late Thursday morning. An official grand opening ceremony was held with several public and state officials on hand. A second roundabout at Blagg Road and Highway 372 is also open to traffic. State and local officials celebrate two new Highway 372 roundabouts. Big deal, wow, cheers!! Yet they weren’t even striped and construction signs were still up. It seems to me everyone forgot all about costs and time for construction. “Experts” said that two signal lights would cost $1 million each; that amounts to $2 million total and would disrupt traffic. “Experts” quoted $200,000 for each roundabout and would be completed by April. So whoever is spending taxpayers’ money said roundabouts it is, even with very little community feedback – most I presume did NOT favor them. Then I read the latest cost for the contract was $4 million, which is $1.35 million less than the reported contract award. Where is this money? Roundabouts in Europe were created with huge diameters not less than 50 feet to keep traffic moving at local speed limits. Not ours – they slow the highway speed down to 20 mph from 45 mph. Not very efficient and dangerous if slowdown is not achieved. Then the frivolous silhouettes and tree planting – and the huge dirt and concrete bunkers in the middle. Why? To spend more tax money? I’m hoping people take the “experts” to task on any following projects. The Marine Corps League 1199 Rose Program would like to thank all the people of Pahrump and Nye County for their support of the Rose Program. Also, we want to thank Walmart for allowing us to set up in front of their store. We are sorry we were not allowed to set up at Smith’s. On June 3rd the Moose Lodge held another donation dinner except this time it was to benefit our Moose Home. The response we received from the Pahrump community was nothing short of amazing. Special thanks to our community partners for their support: poodle-skirted Senior Center members who stopped by before their sock hop, Special Olympics, the orange-shirted Search and Rescue team members, the Nye County Sheriff’s Office, led by Women of the Moose member and Sheriff Sharon Wehrly, and Dean West and his band for keeping everyone entertained. Thanks to Deanna, K-NYE, the Mirror and the Pahrump Valley Times for getting the word out. Of course none of this would be possible without the help and support of our members who went above and beyond. We had over 25 “themed” baskets that we had drawings for, the brainchild of our own members plus all of the wonderful bake sale items provided by the Women of the Moose. As always, the kitchen crew put out a 110-percent effort for our lodge. Without you there would be no donation dinners. Your dedication is unmatched by any other group that I know of. The proceeds of this dinner will allow us to continue to help others in our community as well as our children at Mooseheart and our seniors at Moosehaven. Thank you Pahrump for allowing us to continue doing the work that we love.